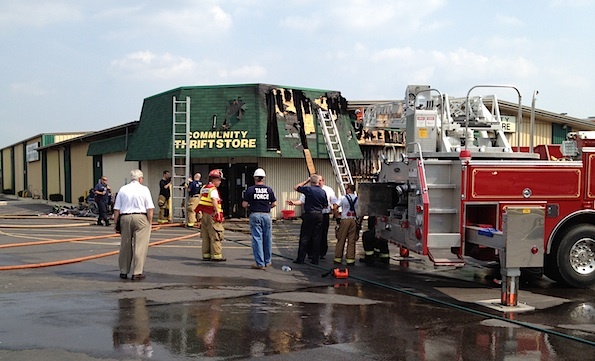 Fire damage at the front of the Community Thrift Store. 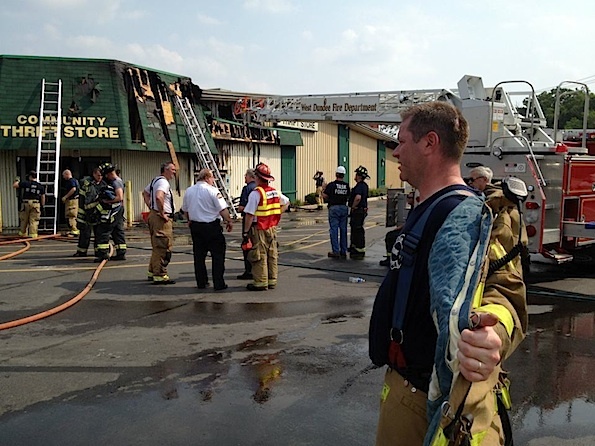 East Dundee firefighter/paramedics responded about 12:53 p.m. Thursday to a fire at the Community Thrift Store at 900 East Main Street (Route 72 and Route 25). The fire at the front of the store was extinguished in about 30 minutes. A third alarm response was necessary because of extremely hot weather conditions, which required rotation of fresh firefighter crews. One person at the store was reported injured and transported to Sherman Hospital. Firefighters from Algonquin/Lake in the Hills, Barrington Countryside, Burlington CFPD, Carpentersville, Cary, Crystal Lake, Elgin, Fox River Grove, Fox River & Countryside, Hampshire, Hanover Park, Hoffman Estates, Palatine Rural/Inverness, Pingree Grove, Schaumburg, South Elgin, Streamwood, Wauconda, West Dundee and others assisted East Dundee firefighters. A Pace Bus also responded to the scene and served as a cooling station. A Salvation MESS Canteen/Rehab truck was also on the scene. A witness said the fire may started from mulch outside the building or wiring behind a wall. No word yet from fire investigators.